Information security company Expel was growing, and needed a video communications system that integrated with G-Suite and could be used for conference rooms effortlessly. After some searching, Expel chose Zoom consolidated platform for video and audio calls, and used Zoom Rooms for conferences. 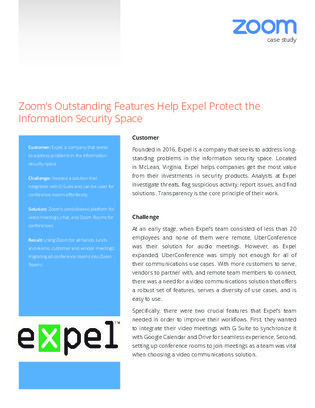 Learn more about Expel’s experience, and why they decided to convert all conference rooms into Zoom Rooms in this case study.